So I just ordered an Asus PB287Q 28" 4k monitor. For now it will just sit on my desk with its own table stand. The goal is to eventually have the 28" display centered and a 24" display on either side ( 24"<28">24"). I'm pretty set on this design though I may have to change the size of the side monitors. I'm looking at an Ergotech stand however, I don't have any experience with multi-monitor stands. Ergotech seems to be a pretty well received brand, but I have some concerns about width with the stand I am looking at. I think that will work and my math says it will. I haven't found a lot of people with this type of set up though. So what are some good options beside Ergotech? Ergotech is best. Would not compromise. Know it's expensive. Check with Skip Clarke/wsgf on twitter with questions. Had an Ergotech 3 monitor stand at my old job. Very similar, if not the same as the one you linked. I wouldn't exactly call it great. I felt like it wasn't all that sturdy, though part of that was probably the fact that it was free standing not bolted to the desk. The arms sagged a bit from the weight of the monitors and made it impossible to get the monitors squared up with each other. The adjustment mechanisms were a bit hard to work with in my opinion. That said, I never saw any other monitor stands in the office that were any better (in fact, most of them seemed to fare worse)... so maybe they are the best and all freestanding monitor stands are just blah. If it had been an option, I would have done what I did in my old house. Wall mounted my monitors on Cheetah arm mounts. That worked far better IMO. Price isn't really a factor in this. $200-$500 dollars is well within the budget. I'll try the Ergotech. Sounds like the stands won, but if you do consider wall mounts I have two of these and they are awesome. Let's you easily convert from stand to sit if that is important and extra desk space is ace. +1 on this. I have their 3 over 3 setup and have no complaints. I've also used it as a 5x1 portrait setup with 24" displays and had just enough room to install a sixth on top in landscape. That's a great idea, but I'm trying to maintain some portability. I have a terrible habit of randomly rearranging things. +1 for Ergotech - I had a couple that clamped onto the desk that worked wonderfully. 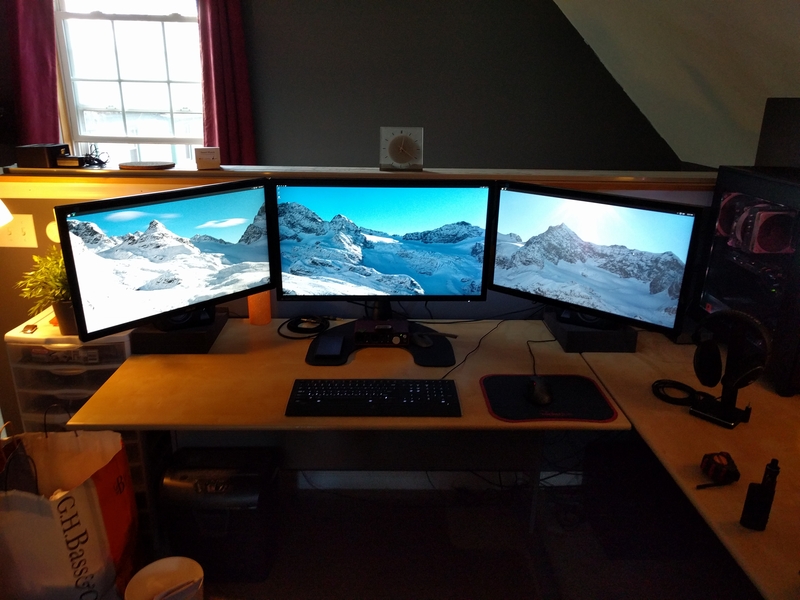 So I am finalizing the set up of my triple monitor setup, all that I have left is to buy longer Displayport, DVI and IEC cables to tidy things up. I still am working on getting everything level and lined up, but I am extremely particular. I'll eventually get to a "screw it, it's good enough" point. Next will be a fall hardware upgrade and sound system upgrade. Here's the setup so far. Thanks for the recommendation everyone!